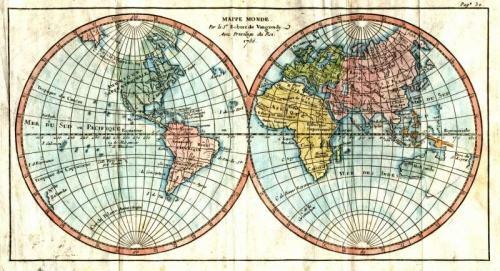 SOLD Mappe Monde, Amerique Septentrionale, Amerique Meridionale, L'Europe, Asie, Afrique. Size: World map: 10.5 x 5.5 inches. Size: Continents: 6.25 x 5.5 inches. From: Methode Abrege et Facile Pour Apprendre. A nice set of six maps from an eminent French cartographic family. The double-hemisphere world map shows the outline of Australia joined to New Guinea and a partial New Zealand. There is uncertainty as to the American North West. North America locates New Albion on the Pacific Northwest coast, as well as showing Indian tribes and colonial claims. South America is shown with some topographical detail, as well as the Amazon and La Plata Rivers. The map of Europe shows country divisions, as well as the major cities and is richly coloured. Asia is well detailed and richly coloured, with depictions of the mountain ranges and rivers and towns from Russia to New Guinea. The map of Africa locates the source of the Nile a little too far north, with some notations of topography. A set of delicately colored maps on laid paper, with some toning and folds as issued. Some scattered foxing and occasional tape on verso. The set of maps is overall in very good condition and will frame well.